My Doctor is apparently a pretty determined fellow. He’s tossed me two more sample pens and has reinitiated the process of getting the med approved by Florida Blue. I guess doctors take it kind of personally when insurance companies tell them what they can and can’t do. I’m just ecstatic that I’m going back on the stuff as it has proven itself more than worthy. My Mom picked up the pens today while I was at work and will be by with them in a few minutes. 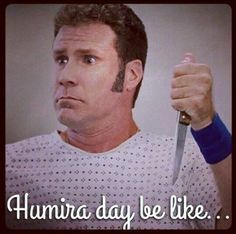 After a painful ten days without today is officially Humira day 🙂 Maybe now I can leave alone what’s left of my prednisone reserve for a rainy day. I must dash now as I have to prepare to shoot myself up with some primo biotechnology. Toodles!